*Advertised Europe Year Round Fares are based off a return trip to Dusseldorf. Fares to other European cities may vary. ALL above fares are PER PERSON and INCLUDE all fuel surcharges and taxes. Rates are subject to high season surcharges, availability and changes without notice. Advertised rates are based on the lowest available fare and may differ at time of booking. All featured “from” prices are based on the lowest priced routing for the destination(s) listed. Taxes may increase if stopping over at a destination, returning from an alternative port or if not paid in full at time of booking. Other travel dates may be available at an additional cost. Please ask one of our Travel Specialists for full details, terms and conditions. You can use our online booking engine to search for availability or book online (Not available for mixed class fares). If rates differ from advertised fares, it may be due to conditions of the fares or limited availability of the lowest fares on the dates requested. Call us to help you find the best fares for suitable dates. Call us if you are booking flights departing within 3 working days. Seats are held when using the online booking engine, however tickets are not issued instantly, our Travel Specialists will contact you to confirm full details and preferred payment method before issuing tickets. Sydney, Melbourne, Brisbane, Canberra, Perth and Adelaide. Other departure cities may be available, please speak to one of our Travel Specialists for more information. London, Paris or *Europe: Amsterdam, Barcelona, Copenhagen, Frankfurt, Istanbul, Manchester, Milan, Moscow, Munich, Rome, Zurich and Dusseldorf. Lowest Europe price is based on an arrival and departure from Istanbul. Other destinations in Europe may also be available, please ask one of our Travel Specialists for more information. Some cities may require internal domestic flights and stopovers in Singapore, please ask one of our Travel Specialists for details. Child discounts and unnaccompanied minors rules vary. Ask your specialist for details. We accept Visa, Mastercard, Amex, Diners. An authority form will be sent to you. Some airlines and most luxury cruiselines absorb the credit card fee. If the fee is not absorbed, you will be notified of the surcharges. Over bank counter or online. This can take one business day to hit our account. If the airfare is due to expire on that day then another form of payment may be necessary. Visit one of our offices during our business hours 09:00 to 17:30 Monday to Friday except for public holidays. Visit one of our offices during our business hours 09:00 to 17:30 Monday to Friday except for public holidays or mail cheque. Please be aware that a cheque may take time to clear and if the airfare expires before the cheque clears then another form of payment may be necessary. Don’t miss out on that bargain. If a special fare must be paid in full and you cannot pay until a later date, you may not have to miss out. A Deposit is payable upon reservation covering the cancellation charge and a fee to cover our paying for it in full. Balance can be paid at a later agreed date. Normal late payment will be between 1-4 weeks and the charge made will normally be significantly higher than your credit card/bank interest rate. All payment must be cleared before travel. Check conditions with your specialist. Same day connections may not be available from all cities. For more information please contact one of our Travel Specialists. Change and Cancellation fees may apply, please ask our specialists for details. Singapore Airlines has evolved into one of the most respected travel brands around the world. Singapore Airlines has one of the world’s youngest fleet in the air, a network spanning five continents, and the Singapore Girl as the symbol of quality customer care and service. Customers, investors, partners, and staff — everyone expects excellence of Singapore Airlines. 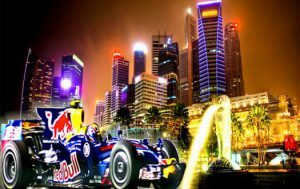 Singapore has been setting the stage for one of the highlights of the Formula One calendar, earning it the title of “the jewel in the Formula One crown”. Singapore will once again raise the bar to create another memorable Formula One event, now is your chance to not miss out. Raffles Hotel is Singapore's most graceful landmark, whose charms now include a shopping arcade, a museum, romantic courtyards and a Victorian-style theatre, Jubilee Hall, a popular venue for film screenings and performances. Marina Bay Sands is set a premier entertainment destination with its vibrant diversity of attractions and facilities. 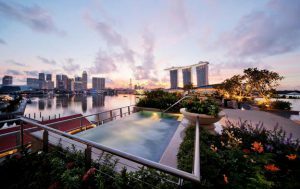 The integrated development is a timeless landmark that possesses a distinct identity which distinguishes Singapore from other cities the world. 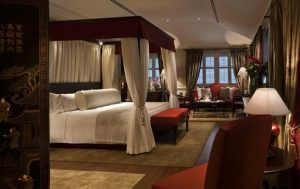 Fullerton Bay Hotel Singapore offers luxurious accommodation a 10-minute walk from Raffles Place MRT Station. Offering free Wi-Fi and free parking it boasts a rooftop landscaped pool and rooftop bar. Dating back to the 1880s, these British Colonial buildings have been restored perfectly, blending in the old and the new into an astonishing, breathtaking fusion. 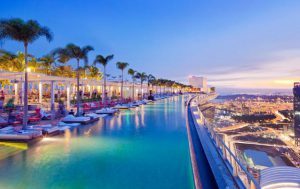 This luxury resort on Sentosa Island is a world of splendid serenity among 30 acres of rolling hills. Note: If you are flying with Singapore airlines and stop over in Singapore, discounted hotel rates may apply. Please contact our consultants for more details. The Singapore Airlines Suites, exclusively available onboard the A380, provide a privileged few with their very own haven of tranquillity. Luxuriate in the largest ever seat; a lavish armchair hand-stitched by master Italian craftsmen Poltrona Frau. At up to 35-inches across, your seat is unsurpassed in comfort and space and features a 23 inch LCD screen. Or for the first time ever, experience the pleasure of sleeping on a standalone bed; not one converted from a seat. Along with our signature turndown service, fine linen and full-sized pillows, you are assured of restful slumber. With only 12 extraordinary suites, the Singapore Airlines Suites is truly a class that is yours alone. Each cabin features sliding doors and window blinds, offering you the freedom to decide on the level of privacy you prefer. Even the leather and wood finishes have been designed in soothing natural hues to enhance the sense of serenity. The premium cabin has also been laid out to offer more stowage space for your cabin baggage and personal items, and a full-length wardrobe – all within easy reach. Whether discussing business or sharing a relaxing moment, the Singapore Airlines Suite is exceptionally accommodating, with a soft leather chaise lounge across from the armchair and a large dining table. Everything required to do business, or enjoy KrisWorld is easily accessible, including a multi-port with power supply, headphone connection, USB ports and more. New Boeing 777-300ER and Selected Boeing 777-300 aircraft. New First Class Available on Singapore Airlines' new Boeing 777-300ER aircraft. The ergonomically sculpted headrest and seat cushions further enhance the comfort of the new First Class seat. The seat back cushions now provide better lumbar support and the seat pan offers a comfortably cradled seating position. The outer walls of the seating area have also been extended and curved to offer ample privacy. An additional mattress topper has been added to the crisp linen, fluffy pillows and plush duvet to create an even better sleeping experience. Passengers are also able to lounge more comfortably in bed mode with our signature plush padded headboard. In-depth research was carried out with lighting experts to develop not only a stylish reading light but one that also provides a conducive environment for reading or working. In addition to reading lights, the seat features ambient lighting, which not only accentuates the seat design but also serves as a night light in a dimmed cabin. Choose from a selection of gourmet masterpieces created by our International Culinary Panel of world-renowned chefs, and accompanied by wines carefully selected to delight the discerning palate. Enjoy sumptuous offerings served on exquisitely patterned tableware designed by Givenchy. Take a break with our enhanced snack menu offering savoury and sweet selections, along with some of the finest gourmet coffee. Enjoy a truly immersive experience on the most advanced in-flight entertainment system available in the air today. Features include a 24-inch LCD screen with 1080p full HD resolution, the award-winning Bose QuietComfort 15 noise-cancellation headphones and an innovative yet intuitive touch screen interface. In-seat power, USB and HDMI ports are all available allowing you to turn your seat into your own unique cinematic experience or work as you please. New Business Class Available on Singapore Airlines' new Boeing 777-300ER aircraft. The seat offers greater recline at 132 degrees and features an improved ergonomic seat cushion. There are 2 new sitting positions created (the Lazy-Z & Sundeck) for more comfort and flexibility in lounging. The seat flips down into a 28-inch wide full-flat bed, at 78 inches in length. It boasts improved bed padding and cushioned headboard for enhanced comfort in both sleeping and lounging positions. A side console specially designed to stow your laptop and tablets is conveniently located within reach in both seat and bed mode. Located near this stowage area are the in-seat power supply, eXport, HDMI and USB ports to connect and charge your smartphones, laptops and other personal devices. Enjoy finest restaurant-style setting and culinary service at 30,000 ft.
Each menu, specially created by our International Culinary Panel of celebrated chefs from around the globe, is sure to appeal to the discerning epicure within you. Indulge in full table service, complete with contemporary designer tableware from Givenchy. And should you wish, your table may be adjusted to varying heights, allowing you to dine in absolute comfort. An 18-inch wide HD resolution LCD screen and noise-cancellation headphones provide countless hours of entertainment as you travel in comfort. Coupled with our intuitive touch screen interface, navigating through our wide array of captivating entertainment options has never been easier. New Business Class Available on Singapore Airlines' A380, A340-500 and Boeing 777-300ER aircraft. The unrivalled space between each seat, providing you direct access to the aisle, is a hallmark of our unique 1-2-1 forward facing cabin layout. Our new Business Class seat – the widest in its class 20 - 30 inches – invites you to be reacquainted with the joys of relaxing on your favourite sofa. Designed with a contemporary colour scheme and enhanced by intelligent mood lighting, your surroundings exude an aura of unmistakable sophistication. Your most spacious seat unfolds to reveal the largest ever full-flat bed in business class, offering plenty of room to stretch out and enjoy a rejuvenating night's rest. Drift off into a restful sleep, surrounded by a light duvet, larger pillows and fresh linen - sweet dreams are just around the corner. All the conveniences you would expect in an office are provided for in a centralised, all-in-one business panel, which includes an in-seat power supply and USB ports. And when it is time to unwind, a wide array of captivating entertainment options from KrisWorld wait on an impressive 15.4-inch wide LCD screen. Settle your reading glasses in a snug storage compartment and stow your hand-carry bags within easy reach. You will also find additional storage space cleverly integrated into the seating area. Our new Business Class is the most spacious the world has ever seen, with the largest seat and fully-flat bed in its class. These new cabin products are fitted on Singapore Airlines Boeing 777-300ER, A380 and A340-500. Please include any relevant details including dates, destinations, any other arrangement in conjunction with the product you enquire about, special requirements etc. Availability changes on a daily basis. If you advise names as per passports (middle names not required), we can hold seats for you. You can cancel without any charges. If you do not find the fares as adverised, they may not be available on the dates or routings specified, contact our specialists to check available dates or waitlist on dates required. Find out which airlines are the world's best for business class. Find out which airlines have the best first class cabins in the world.